In my childhood i don't like to drink milk. So my mom started to give milk in the form of coffee or health drinks.But one day i tasted the coffee with biscuit dipped in it. 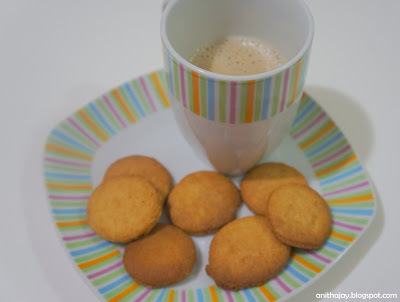 After that i love to have biscuits with coffee till now. Having hot coffee with biscuit dipped in it in a cold weather is amazing. No one snack can beat this. In a bowl Cream the butter with sugar. Then add egg and beat well. Add vanilla essance and beat well. Sift the flour and baking powder separately and keep aside. Now add the dry ingredients slowly and make a soft dough. Roll the dough and use a cookie cutter to make required shape. Grease the cookie sheet and place the shaped cookies. Bake it for 20 - 30 minutes or until the color changed to brown. Cool it wire rack and enjoy it with Hot coffee. Sending this recipe to Event “Sending to What is with my cuppa and Nupur's page"